★Made from welded steel construction with a soft rubberized coating ensures your bike will stay safe and protected. ★Our Rack folds upward securely to minimize space when not in use. 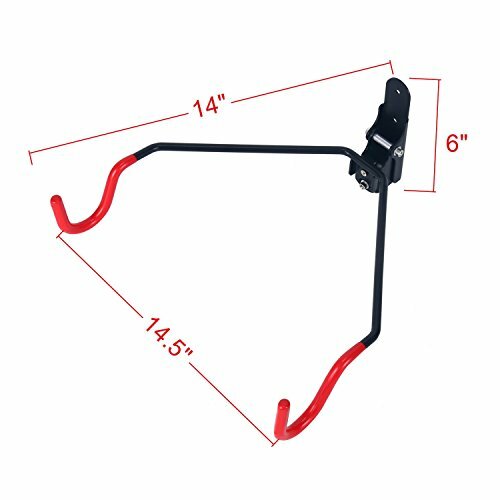 Includes wall mounting hardware secures your bike safely to the wall. ★Comes with a set of screws for installation on stud mounted wall. (It is HIGHLY recommended to mount the rack to a wall stud to avoid poor installation support). ADJUSTABLE RACK: to handle all types of bike frames. 100% Solid Steel Construction for maximum durability. SOFT RUBBER Coated hooks protect bike frame and prevent sliding & Folds up when not in use to save space. HOLDS up to 50 lbs of weight.